Alright, alright. I’ll admit it. I’m a junkie. I am in love with Project Runway. There’s just something about it that I’m in love with. It’s on the same level as Extreme Home Makeover where you get to see them build something original and artsy from scratch, but I like project runway more. Although the challenges change each time, I always get so attached to the designers. Even the bitchy ones end up finding little places in my heart (aside from Wendy Pepper). I love it when the judges are bitchy whether it’s with each other or with the contestants. Fashion really is a cut-throat business and you get to have little tastes of the dramatic roller-coaster ride through the show without going over the top ala America’s Next Top Model. I hear people say sometimes that they can’t stand reality shows, but I wonder if it’s more the reality shows where they don’t do anything. I have trouble watching something like Jersey Shore, but shows like Project Runway, Face Off and Project Accessory really pique my interest. I like the creativity that goes into it and the way that the artists on the shows discuss their inspirations. I’ve never been able to sew, knit, draw or anything even remotely close to that, so the process that they go through is fascinating to me. Even if it could be considered trashy television (and it definitely does have its trashy moments), the way that people conceptualize and think about fashion almost makes me feel like I’m studying a species which is similar to that of the writer, but at the same time completely different. 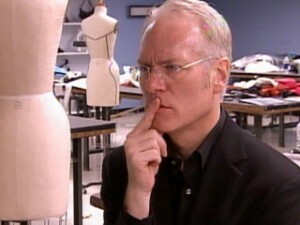 Plus, I have this horrible little crush on Tim Gunn. He is always such a positive mentor and you can tell that every life he touches changes for the better in the show. Even the people who decide that they don’t want to listen to what Tim has to say will admit that he is a great person and that they love having him around. There’s something about the way that he talks that I am infatuated with. It’s not just the enormous scope of his diction or the fact that he uses words like “incongruous”, but the way he speaks. He almost seems to have an accent that is a mix between a British and American one. For now, I watch Project Runway when I need a break. I go through and watch the older seasons while I’m eating or trying to detox from a long work day. It may sound strange, but watching other people scramble calms me down.